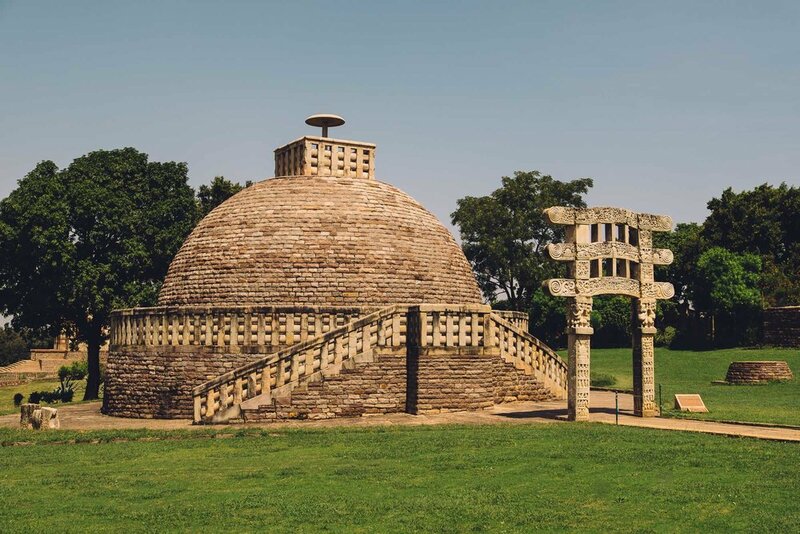 The Sanchi stupas sit on an outcrop on plains trimmed in the distance by low hills with languorous ridges. The Halali flows close by. There’s the wind of the plains about the monuments, but there’s also the sun bearing down on them, and the few trees around don’t help so much the crowds. The stupas aren’t designed to offer shade. But you feel no inconvenience in Sanchi. You only experience peace. There are things to see: Fine carvings of Buddhist divinities and representations of Buddha and Dharma and Sangha, so masterfully rendered that you shake your head in disbelief that such work was possible in India’s earliest stone monuments. Besides the Buddha, there’s a square panel showing Ashoka, on a thorana at the entrance — portly, seeming to be recovering from a fainting spell. Two queens support him: the sovereign was grieving the death of a Bodhi tree. After a few moments spent gazing at the art, you stop and turn inward, wanting to savour the spiritual. You will climb the stairs of the stupa, and walk round the bare egg-shaped mound, and close your eyes, fingers grazing the mound to keep course and not fall off. Done with Sanchi, walking the gentle gradient down the hill and out, you’re already speaking a lot less — I can tell you I was. The waiter opened a wide visitor’s book over my dinner plate. He pointed to a comment in it by Raza Murad, a veteran Bollywood actor. Raza Murad had praised the meal, the service, the ambience. He hadn’t checked into the rooms, the waiter said, dropped in only for lunch. Taking the cue, I lauded Aaram Bagh just as much, for service over two-days and for the delicious meals. Deserving praise, I must concede. The resort is a compact palace a few kilometres off the highway, 12 kilometres from the Sanchi stupas. It was surrounded by cropped rice fields that run up to hazy blue hills all round. Over dinner, our group of eight bantered about the use of a palace in that desolate place. “To arrive at harvest and count moolah.” Or, “For time with the mistress.” Checking the hotel’s website now, I read that successive maharajas visited here with their maharanis for rest. But also they used the place as a hunting lodge and once invited the British viceroy to join in. They don’t say if the viceroy accepted. Raza Murad’s latest big movie is Bajirao Mastani, in which he plays the Nawab of Deccan. At 71, he’s been in some two-hundred films, and is not quite finished yet. Only 3 kilometres from this propped-up vestige of royalty, at Satdhara, right by the Halali flowing in a deep, deep gorge, is a profusion of even more stupas, the highest among them nearly as tall as Sanchi’s. We set out to Satdhara morning at 6:30. Not a single other tourist blighted the place, but a few Langurs marked our passage from a distance. An occasional local passed us by, and one among them brought us to a fresh dig and said a hoard of begging bowls of bhikkhus were found there, taken away to the museum now. Among the stupas are dispersed a host of monasteries, reduced to the base by time. It is a concealed expanse, leafy and serene, and exists merely to house monasteries, it seemed. Riches. Renunciation. Surrender. The contrast lay before us within a three-kilometre stretch.